I make my way to the back room of the library, a place of dust and shadows, of leather bindings and musty pages. The cold and the quiet should be soothing after weeks in the summer city heat, but what should and what is stand apart, separated by the finest of hairs. Instead of calm, I feel tension, my mind stretched out like the skin of a drum. The clatter of a chair down the room is like a drummer beating an irregular rhythm on my soul. I set my bag down on a table and make for the folklore shelves. Near to them, that chair shifts again, its weary wood creaking beneath the weight of the room’s other occupant. His face is hidden beneath the hood of a Nike sweatshirt, but I can see jagged, broken fingernails tapping against an old biography of Descartes. Even with company, I can always lose myself in books. I scan the spines, torn between researching animal myths and wanting to crack open a volume of local ghost stories. If I think about it, I’m sure I can wind the two together. After all, that’s what I do – follow the paths of logic and imagination, turning separate facts into links in a chain. I catch a glimpse of movement just too soon to avoid human contact. The hooded man reaches out for a book on the shelf in front of me. I flinch and as I do so my hand brushes against his. The touch of those ill-kept, twisted fingers sends a shudder through me, followed a moment later by something else. A rush of thoughts – incidents, facts, and connections, knowledge I didn’t have before. I let out a childish laugh and take a step back, pondering one of the strange creatures I’ve seen, like an old engraving of Black Shuck and yet not. I can use that. It’s perfect for… for… for something. Now the image is gone. I shake my head, as though I might somehow shake the thought loose. There was a dog, wasn’t there? Some dark creature? Something I felt excited for? 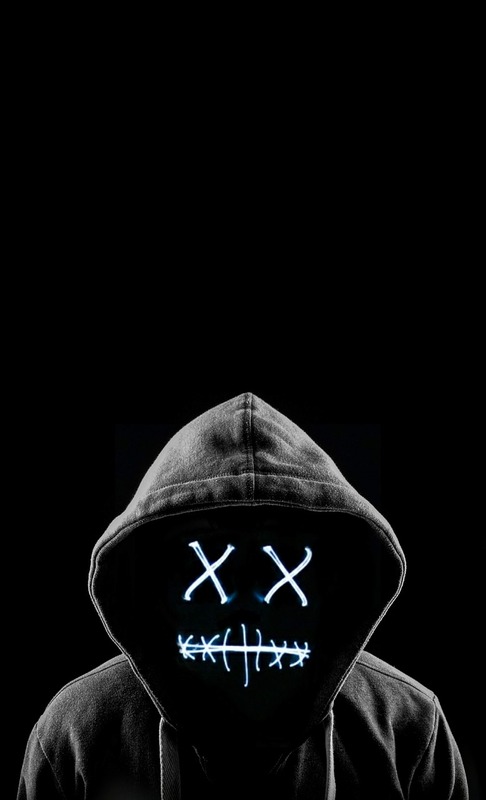 I look at the man in the hooded. He looks back with soft, empty eyes. He takes a step back, arms held wide, face a picture of innocence. “What are you?” I stare at him. There’s a smoothness to his face that isn’t quite right, like an oversized glossy cover hiding the stained bindings of a hardback. The musty smell of old books turns sour in the air. Why am I looking at this man? I thought I knew, but that knowledge drifts away like a dust mote through a sunbeam, vanishing into shadow. I look him up and down, trying to make sense of it all. He’s wearing trainers, jeans, a hoody. His face is unsettling, unfamiliar, ghostly pale. And what are those soft shoes that he’s wearing? He reaches out and again there comes a wave of insight. Thoughts of who he is, where he has been, what he has seen. I try to catch them as they pass but they slip through me and are gone. I’ve spent years pursuing the supernatural, but if I’ve read of something like him then I can’t remember it. I spool through memories, long lines of ghosts, fey beasts, and urban legends. None quite fits, but which is closest? As I try to recall them again, there’s nothing there. My own memories have been carried away with his. “Know me,” he whispers, reaching out again. I step back, hit a chair, and fall across it, landing with a thud on worn floorboards. Why am I staring at a white tick on red cloth? It’s just a swoosh. A nothing. He leans over. I still remember enough to make my heart race and the breath catch in my throat. The harder I struggle to focus, the more thoughts flee me, like sand trickling through my hands. Then comes the end of the chain. There’s nothing here. Just an emptiness where the things that matter to me were. I look up into dark eyes set amid a pale face. For one last moment, I think. If you enjoyed this story and would like to read more like it then check out my collection of fantasy stories, By Sword, Stave, or Stylus. Or you can sign up to my mailing list, where you’ll get a free ebook and a flash story straight to your inbox every Friday. Writing can be a pretty lonely business, so when there’s an opportunity to meet up with likeminded people, I’ll leap on it. And last weekend was one of the best of those meetups – Fantasycon. Fantasycon 2018 took place in Chester. As always, it was run by a team of hardworking and helpful volunteers – if any of you are reading this, thank you so much! And as always, it was full of cool fantasy fans and writers from across the UK and beyond. I love Fantasycon. 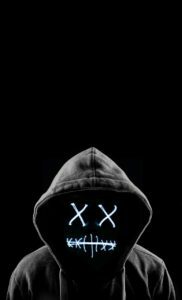 I know enough people in the community now I can always find someone to chat with. It’s great catching up with people in the bar, where I spend most of the weekend. And that leads to meeting even more great people to chat with next year. Spending a weekend with people who share your passions is great. You know that you can always find things to talk about. If the person you’re talking with doesn’t share your enthusiasm for a particular book or movie then they’ll at least understand it. It’s an emotionally uplifting experience, as well as one that fills me with good ideas about what and how to write. Blogging in Genre Fiction – Kit Power, Alisdair Stuart, Micah Yongo, and Kate Coe talked with passion about how they blog. Turns out it’s mostly about that passion. And now I have a bunch more blogs to follow. The Elderly Guard – Charlotte Bond, R B Watkinson, David Stokes, Dion Winton-Polak, and Mark Latham discussed older characters in fantasy. My main takeaway – in an apocalypse, older people have lots of useful skills, so keep them around. Breaking the Glass Slipper live – One of my favourite podcasts, this time discussing mysteries in genre fiction. Excellent guest work by Claire North and RJ Barker. Look out for that in their podcast feed. From Colonisation to Decolonisation – Nick Wood, Naomi Foyle, Stewart Hotston, and Allanah Hunt talking about colonial and decolonising sf+f. A difficult and important topic, it’s really good to see the fantasy community engage with this, and I’m very happy to just shut up and listen to those with direct experience. Putting the “Punk” in Fiction, with Lee Harrison, Ren Warom, and Kit Power. As somebody said, adding “punk” to a genre is really just a way of trying to say “look, it’s cool!”, but we still had a great debate about subgenres and making fiction more punk. From Fanon to Canon, moderated by Cheryl Morgan, with Allanah Hunt, Chris Jarvis, and Kate Coe. I wasn’t sure I had anything to say on this, as I don’t write fan fiction, but it turned into a fascinating debate about working with existing stories and the connections between power and culture. Renaissance Fantasy, with Anne Lyle, Jeanette Ng, and Den Patrick. We talked about what good and bad things fantasy writers take from the European Renaissance, what we’re missing out on, and a little bit about other renaissances. Going to a convention always means finding more books I’d like to read, so the lure of the dealers’ room is impossible to resist. 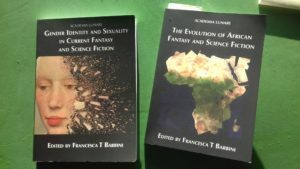 This time I was relatively restrained, only buying two non-fiction collections from Luna Press, one on gender and sexuality in sf+f, the other on African sf+f. I’ve already read the first one, which was full of insightful and fascinating articles. Having started the other this morning, it promises to be the same. Luna Press are doing some great work right now, putting out both innovative fiction and valuable commentary, and I’m pleased to have these on my shelves. Fantasycon is a great event. If you’re a fan of fantasy or horror fiction and you live in the UK then I heartily recommend it. Next year we’re off to Glasgow – maybe I’ll see you there? The police officer gave her a smile so forced it would have shamed a politician. Emma took a deep breath. There was no time. Claire was missing already, probably dead, like so many others before her. Emma had to make them listen. A sound from the street made Emma look around. A car was rolling past. At the wheel was Dr Stanley, the psychiatrist they’d sent her to after the town council incident. The man who had tried to have her locked up. She dashed out of the door and away down the street. To her mild disappointment, nobody gave chase. All the data Emma had gathered – the missing persons reports, the stories of mysterious incidents, the way the rhubarb lorries followed the ley lines – it all led her to this one place. A large rhubarb shed on a farm outside Wakefield, it was the sort of building farmers brought rhubarb into to force grow them before the so-called harvest. All a cover story, of course. There was probably a portal to another dimension there, hidden among the manure and wilted leaves, or some chasm from which the dark forces of the rhubarb triangle emerged. She crept up to the barn. There were no windows. They said that was necessary to make the rhubarb grow tender, but she knew it was a cover story, a way of hiding the truth. With trembling hands, she squeezed the bolt cutters shut. The lock fell to the ground. The door creaked open. Heart pounding in dread, driven on by the need to know the truth, Emma stepped inside. Something hit her across the back of the head, and the world went black. Emma’s head hurt. Her limbs wouldn’t move. The elder forces must have taken control of her, letting her stay conscious just so that she could see her coming doom. The cold, heavy grip of terror settled across her body. The cold, heavy thing holding her in place wasn’t a void-spawned tentacle or the workings of her mind. It was heavily manured soil, in which she was buried up to the neck. A dozen people in robes stood over her, lit by candles. One of them held a knife. They were all middle aged or more, with greying hair and an impressive collection of wrinkles. “Are you going to sacrifice me to elder gods?” Emma whispered. Emma had gone through horrified already. Now she found herself disappointed. She wasn’t to die for the sake of fruit. The soil around her was loosely packed. She managed to work one hand through it, up towards the surface. Emma thrust her hand through the dirt and grabbed the front of the man’s robes. She yanked him down, slamming his nose into the top of the head. It hurt, but his scream made it worthwhile. She grabbed the knife as it fell from his grasp and pulled herself clear of the dirt, using the fallen man for leverage. Compost fell from her like rain. “Who else wants to sacrifice me?” she asked with a fearsome grin. Emma watched the police lead the rhubarb cultists out of the barn, some of them limping or clutching their wounds. “You’re better than this bunch of nutters,” the officer replied. Behind them, in the darkness of the shed, the rhubarb stirred. The being that sent it had been relying on blood to open a portal. Now it would have to find another way. The rhubarb shook with frustration. It hated being kept in the dark. The rhubarb triangle is a real thing, honest. Just not a very exciting one. Unless you really like rhubarb. Thank you to Emma for the idea for this story. If you enjoyed it, please share it and consider signing up to my mailing list, where you’ll get a free e-book as well as stories straight to your inbox every week. Reading Charlotte Bond’s Monstrous, I finally pinned down why humans are the scariest thing in horror. I know that “people are the real horror” isn’t an original insight. It’s the central theme of The Walking Dead, and if it’s on big-budget TV then you know it’s not a new idea. But sometimes it’s hard to work out why something works. Monstrous is all about this. The teenage protagonist Jenny is dragged off to join a commune by her mum. 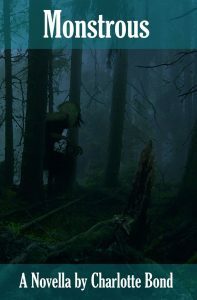 There’s something dangerous lurking in the woods around them, but the real unpleasantness comes from the people. It works incredibly well. One particular act of brutality (vagueness to avoid spoilers, go read the book), had me frozen with tension. It was just so awful and so real. And that was when it hit me. In horror, the monsters can be more extreme, but the humans are more believable. What they do to each other has a sense of reality. That makes it scarier because it could actually happen. Worst of all, we can imagine acting like that human more easily than we can imagine acting like the monster. Recognising a potential for darkness within ourselves is the perhaps the most terrifying thing of all. Monstrous is about how humans are the real monsters. If you want to explore that particular brand of horror, I heartily recommend reading it. Just don’t expect to sleep well afterwards. Learning from disciplines and genres other than your own is one of the best ways to expand your writing. It helps you look at the craft from different angles and come up with ideas you would never normally encounter. This is especially true when there’s someone smart and insightful talking on the subject. So while I don’t often write horror or games, Ian Thomas’s talk at Nine Worlds on making horror in games gave me some great food for thought. Looking through my notes, there was plenty of stuff I’ll save for if I ever run live roleplay again. Things like using all your senses, knocking players off balance emotionally so that they stop and watch, or providing a pile of in character documents instead of a character description so that players would fill the gaps and imagine themselves into the character’s life. It’s thinking outside the default approach to games, which is how you make something that stands out. But there were some lessons that clearly apply to writing as well. Scare the player/reader, not the character. After all, it’s the reader’s emotions that will keep them engaged. And to a large extent, this applies to other emotions. Whether it’s leading readers into a crush on a romantic lead or making them really angry at the villain, those feelings are the real power in a story. So consider the readers’ emotions. Put yourself in the player/reader’s shoes. What will they be thinking about at any given point, given the gap between what they know and what you know? Leave gaps. Our human survival instinct means that we are constantly looking for patterns and jumping at shadows. So create a few bright, clear points where everything is specified, and then leave players/readers to find their way between them. Let their imaginations make it real. Be careful not to break the player/reader’s mental model of what’s going on. That can wreck their immersion, and so the emotional momentum you’ve built. If you’re going to pull the rug out from under their feet, make sure it’s in a way that adjusts that mental model, not shatters it. And if you want to read more on how Ian applies this stuff, check out the write up on the game God Rest Ye Merry, which friends of mine have been raving about ever since. Physical darkness is one of the classic symbols in horror. It’s the place of danger where unnamed things lurk. In as far as the monsters often represent parts of our own psyches, the darkness represents the subconscious, the fearful place where malfromed thoughts and feelings lurk, waiting to spring out at us. As such, the darkness is the perfect beginning for Laura Mauro’s Naming the Bones. Naming the Bones is a story rooted in mental health. Londoner Alessa Spiteri, the protagonist of the story, survives a bomb attack on the tube. In the aftermath, she finds herself overwhelmed by the psychological trauma. Then she sees a monster lurking in the darkness and begins to fear that she’s losing her mind. That is until she meets someone else who’s seen what she has, someone with whom she can maybe face the monsters, both in the tunnels and in her own mind. Even the name of the book points toward this. One of Alessa’s coping strategies is to calm her mind by listing the names of the bones in the human head. Her psychological defense is built around her understanding, and by extension control, of the physical defenses that protect a brain and the mind within. My experiences with mental health aren’t the same as Alessa’s. I’ve struggled with depression and have friends with a range of other issues, but I’ve never had contact with post-traumatic stress. Yet Alessa’s battle with it, and with the monsters that represent it, matched everything I’ve seen about approaches to mental health. Broadly speaking, I’ve seen two approaches – coping and rebuilding. They can be used together and support each other, but they function in different ways. Coping is about finding ways to get through the day despite what’s ailing you. 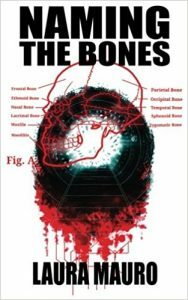 In Alessa’s case, it’s about building routines, finding friends to support her, naming the bones in her head. It’s about avoiding the monsters and learning to live despite knowing that they’re out there, both in the darkness and in her mind. Rebuilding is harder. It means facing the roots of what’s bringing you down. It’s long conversations with professionals and friends about topics that can seem unbearable. It brings long term benefits by building healthier foundations for a mind. But in the short term it can make everything harder to cope with, digging up old hurts and unrecognised difficulties, unravelling malformed coping mechanisms. It’s scary and it’s not something everyone can face. In Alessa’s case, the trauma monsters make the process of rebuilding very real. Alessa has the chance to literally face her demons, but she has to decide whether that’s the right path for her, as well as how to deal with the darkness when she faces it. And she has to decide who she can trust, whose advice will help and whose will lead to disaster. Because facing monsters, like digging into your own emotional baggage, can be self-destructive if it goes wrong. As someone who’s spent years facing depression, I felt a lot of empathy for Alessa when she wanted to curl up and hide from the world. That created a connection that carried me into a story about how to move on from there. It was dark and intriguing and made me think about people I know and the choices we’ve made about our mental health. Few genres can match horror for bringing the subconscious into the light. It’s good to see the genre exploring what happens when that darkness lies exposed, how we move on from there. Conventions are one of my favourite things about science fiction and fantasy fandom. The chance to hear and talk about sf+f with like minded people is great. And with Derby within day trip distance, one of my regular ones is Edge Lit. I didn’t go to many panels this Edge Lit. I enjoy the panels as conversation starters, but I get easily distracted and end up staying in the bar. The one I went to was on epic fantasy. 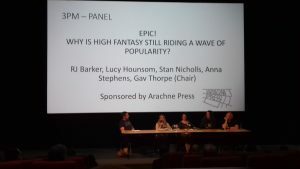 The panel’s starting question was about why epic fantasy is so popular at the moment. But there’s a reason why I say “starting” question. The titles of panels are seldom their whole focus. Instead, they provide a theme and a starting point for the panelists to work from. What’s interesting is what they do with it. This particular panel featured RJ Barker, Lucy Hounsom, Stan Nicholls, Anna Stephens, and Gav Thorpe in the chair. 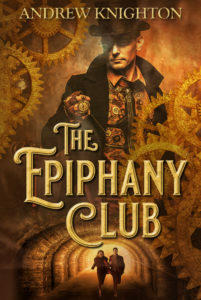 They talked about how epic fantasy lets them write the stories they want to tell, about how various media are making it more popular, about the bad cliches that can be a problem, and all sorts of other things around what epic fantasy is. It was a wide-ranging and fascinating discussion that ended with some good recommendations for books. This is the joy of panels. It’s hearing smart, lively people talk about interesting stuff. The panel titles might get a bit repetitive, but it’s the panelists that bring them alive. Alex Davis, who runs Edge Lit, ran a workshop on running events. It’s certainly something he’s got experience on, making it a valuable addition to the convention. I’ve been toying with the idea of running some sf+f evenings in Leeds, so I went along to learn about the practicalities. I have too many books on my to-read pile already. Every convention I go to, I plan not to add any more. Every convention, that plan fails. 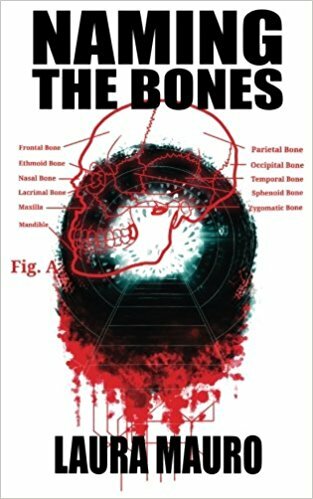 My main purchase this time was Laura Mauro’s Naming the Bones. I heard her read from this at the book launch and it caught my attention. A horror story that starts with a terrorist attack and ends up in the tunnels under London is something new for me, but with familiar elements I’m fascinated by. I’m looking forward to reading it, though probably not when I want to be able to sleep. And then there was the raffle. I bought five tickets. Three of mine got drawn from the massive bowl. Slightly embarrassed, I asked them to draw again and let someone else have my prize the third time. Because like I said, I have too many books. But hey, I won! In summary, Edge Lit 6 was everything I expected, in a good way. Books, panels, conversations, more books. Plenty of inspiration for what to read and write. Needless to say, I’ll be back in the winter for Sledge Lit. 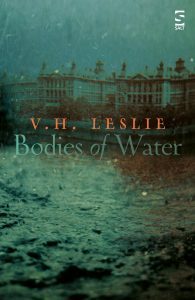 When I wrote my post about history and horror, I hadn’t yet read V. H. Leslie’s unsettling Bodies of Water. But this book is a great example of how history and horror can collide to great effect. Bodies of Water is the story of two women, Evelyn and Kirsten. They live in the same building but in different eras. For the Victorian Evelyn, Wakewater House is a hospital using water to treat women’s ailments. For 21st century Kirsten, it’s a new home, a near-empty building of converted flats in which damp is a constant problem. Both women are struggling with the harsh events that life has thrown at them. Both become intrigued by the waters lapping at their lives. And both face strange and disturbing events. 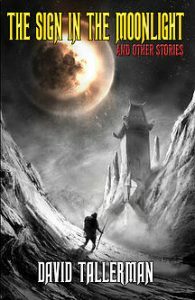 I was drawn to this book after hearing the author talk about it at Fantasycon. She’d researched the way women were treated by doctors and the police in Victorian England, uncovering some fascinating and deeply troubling practices. It’s an issue that the book explores, an unfamiliar area of history that draws attention to the creeping, socially authorised nature of much abuse. Setting this alongside a modern story helps to draw attention to the dark, strange, and yet somehow too familiar elements of both settings. The history accentuates the horror, while the horror brings out important themes in the history. Like much of the best historical writing, by implication it also says something about the modern world. The juxtaposition of parallel narratives makes that implication clearer. This book isn’t going to be everybody’s cup of tea. It combines history, horror, and feminism to explore all three. Leslie’s understated approach means that it lacks the immediate intensity off some writers in all three fields. Like a spreading damp, it eases toward its potentially destructive conclusion. If you’re looking for something that’s thoughtfully, almost gently unsettling, and if you’re interested to see these genres intersect, then It’s well worth reading. If nothing else, it’s a good lesson in combining genres. I love it when stories have strong narrator voices. The way the story is told gives you a sense of the narrator’s character without describing them directly. It can make for a really interesting read. This year, I’ve encountered two Cthulhu mythos stories that do this well, and that make the mythos accessible to someone like me who doesn’t know it well. First up is “My Friend Fishfinger by Daisy, Aged 7” by David Tallerman. It’s told from the point of view of a 7-year-old girl. She’s describing her friend, nicknamed Fishfinger, who is nice but unusual. Her parents worship a strange god and they’re going to take Daisy on holiday with them. From the child’s point of view, it’s incredibly sweet. As an adult reading the story, it’s obvious what’s amiss, and Cthulhu fans will doubtless know exactly what it refers to. 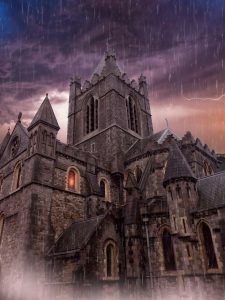 The contrast between the strong character perspective and the reader’s understanding creates a wonderful strand of dark humour, as well as telling us a lot about the characters involved. Then there’s “Donald” b y Adrian Tchaikovsky. An academic, responding to some unnamed investigator, tells the story of his encounters with a man named Donald Toomey. Again, there are the ironies that creep in through the gaps between reader and narrator understanding. There’s also a great pleasure to be taken in the narrator’s voice. His opinions, biases, and assumptions flavour the text like tasty spices. There’s a certain amount of belligerence and bloody-mindedness. There’s also a tendency to assume that the world works a certain way, a set of academic assumptions that are carefully shown rather than crudely explained. It makes the storytelling subtle and the voice authentic. I love this sort of storytelling and have set myself the challenge of trying it in the next few weeks. In the meantime, you can find “My Friend Fishfinger” in David’s collection The Sign in the Moonlight. 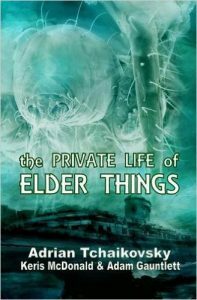 “Donald” is in The Private Lives of Elder Things. And if you’re after more supernatural horror then check out the latest issue of 9Tales Told in the Dark, featuring my story “Cold Flesh”.